The best hard-tail Juggernaut ever built. We SOLD out of the first run of MX Ultra. It is on pre-sale now - delivery in 1st-2nd week of May 2018. As an incentive to pre-order we are giving you free rear rack and a free upgrade of front fork to RST Guide front suspension fork (worth $299 USD). Note that when this bike is available in stock, the prices will be higher than the pre-sale price now. Limited supply - first come, first served. 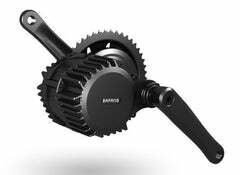 2018 Ultra bikes will be equipped with the latest version of the Ultra motor with metal reduction gears. Biktrix is the first company to bring Ultra bikes to production in the world. With our first batch of bikes already sold and user tested, we have more experience with these bikes than any one else. Street legal mode for Canada. 500W nominal, 1000W peak. Top speed limited to 32kph. Off-road use only. 1000W nominal, 1500W peak. More power than you'll ever need.